Results 1 - 15 of 28 for "bird"
Actual Location: Museum für Volkerkunde, Vienna, Austria. Measurements: 36 x 33 x 23 cm. Reference: Boos 1966b: 383, fig. 353; Winter 1994a: 155. Comments: Human figure with a bird in the headdress, possibly a turkey buzzard. He is holding a bag of incense in the left hand. For similar pieces, compare with MFR 1845, MNA 6-798 and MNA 6-799. Actual Location: Museum für Volkerkunde und Vorgesshichte, Hamburg, Germany. Collection: Dr. C.W. Lüdus (NAA photo archives: batch 92, box 6, binder 2). Color: Dark grey clay with a light grey coating. Reference: Boos 1968a: vol. III, 30, plate XIV a & b.
Glyphs: Glyph F in the headdress. The bird's eyes are glyph E.
Actual Location: Unknown (before at Frissell Museum). Reference: Boos 1966a: 63, fig. 43; Paddock 1966: 148, fig. 150. Comments: This figure is holding a type of staff in the left hand and a shield in the right arm. A bag of incense, with the head of an animal, probably a jaguar, hangs from the headdress. Bags of this type feature in headdresses of human figures carved on jambs in San Lázaro Zautla (cf. Urcid 1991: 10). Behind the bag is the head of a bird, perhaps a quetzal, placed on one side. In December 1959, while this piece was being taken to an exhibition, the transport car had an accident near Huitzo. It was stolen from the scene of the accident and never recovered. Reference: Caso and Bernal 1952: 199, figs. 333-334. Comments: Caso and Bernal use this piece to define category "God with Head Piece of Wide-Peaked Bird". According to them, the wide-peaked bird could be a tlauhquechol. Glyphs: The mask of glyph U in the headdress. Color: Dark grey clay with vestiges of green. Reference: Boos 1964: plate IV; Boos 1966: 83, fig. 63. Comments: A very similar piece exists in the Museé du quay Branly in Paris, but the bird face in the headdress is replaced with glyph E (cf. MQB 87.101.47). Glyphs: In the headdress the glyph F is placed over the glyph C.
Measurements: 57 x 44 x 27 cm. Reference: Rediscovered Masterpieces of Mesoamerica: Mexico-Guatemala-Honduras, 1985, fig. 138. Comments: There is a bird's head in the headdress, possibly a "tlachechol". Compare with BMS 15997. Glyphs: Glyph for doe in the headdress. Actual Location: Museum of Cultures of Oaxaca, Oaxaca, Mexico. Provenance: Mound YW, well 1, offering 2, No. 8, Monte Albán, Oaxaca. Reference: Caso 1938: 19, fig. 27; Caso & Bernal 1952: 47, fig. 64; Caso et al. 1967: 125, fig. 79. 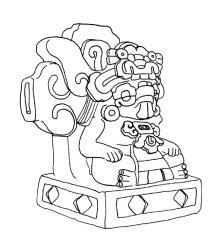 Comments: The shapes in the throne have been opened on the sides and it seems this was done on purpose to be able to decorate the piece with feathers, plants or other objects. In the upper part of the throne, there are also holes to allow the decoration of the piece. 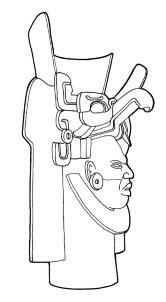 Caso says that this piece was found as an offering to Stelae 16 (Caso 1938: 19). Skulls of birds and a "very dark" soil were found inside the piece (Caso, Bernal y Acosta 1967: 127). This piece was found next to another urn (see MNA Mont. Y.W.of.2-2). Both were covered with broken pieces of earthenware and flat stones to protect them. Compare with ROM 1936, MFR s/n 6, SMI 115002, UPM 29-41-707 and KERR 6460. Glyphs: Glyph C in the headdress. The glyph for corn grain in the throne's dossal. 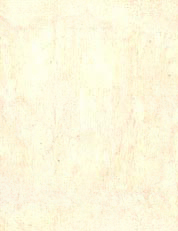 Color: Grey clay with traces of white and red paint. Face painted in red. Comments: According to the information provided by Edward Seler, this piece was found by explorer Dupaix at the beginning of the 19th century, in Mitla. Jaguar headdress and in the jaguar's forehead, a bird's head. Another bird head hangs from a pendant. The piece has no feet and was probably used as the lid of another container. Glyphs: Two glyphs for heart on both sides of the headdress. Reference: Caso and Bernal 1952: 208, fig. 345; Paddock 139, fig. 132. Comments: Only the head of this piece, which has been restored, is exhibited at the National Anthropology Museum. Caso and Bernal published the whole piece, but it is possible that the body is a contemporary attachment. 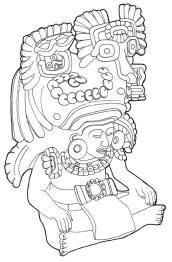 They said: "In the headdress, a wide-peaked bird and the characteristic eyebrows; but on both sides, two serpent heads can be seen. 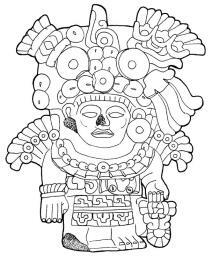 Its fine work is a typical example of the art of Zapotec potters in the period IIIA" (Caso and Bernal 1952: 205). Glyphs: The U and M glyphs (reproduced twice) in the headdress. Registration: MNA cat. 6-5801/ Inv. 10-61343. Provenance: Tomb 77, no. 26, Monte Albán, Oaxaca. Measurements: 81.5 x 66 cm. Color: Painted in blue, yellow, white and red. Reference: Caso 1935: 26-27; Keleman 1943: vol. II, plate 121c; Toscano 1944: 429; Caso & Bernal 1952: 202-203, figs. 341, 341 bis; Covarrubias 1957: plate XXXIV; Paddock 1966: 124, fig. 80; Gendrop 1970: 137, fig. 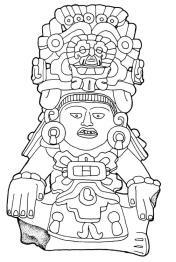 158b; Pre-Columbian Art 1990: 151, fig. 52. Comments: This piece was found by Alfonso Caso in the period PMA IV (1934-1935). According to Caso and Bernal, the piece is an early expression of the "God with Head Piece of a Wide-Beaked Bird" (1952: 204). Flannery and Marcus believe that the urn represents a warrior because, according to them, the head piece worn by the figure is a bird of prey (1996: 199). See also MNA t/77, no. 3. 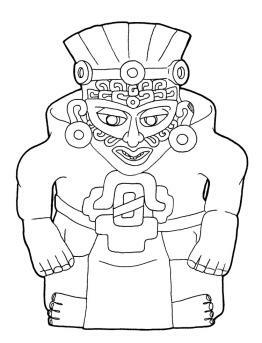 Color: Grey clay with traces of red pigment in the headdress. Reference: Caso and Bernal 1952: 246, fig. 393. Comments: Caso and Bernal classify this vessel under category "God 5 Turquoise". 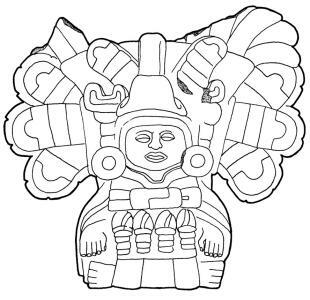 It features a bird's mask, corresponding to glyph X.
Glyphs: The pectoral is the glyph for corn and is hanging upside down. Compare with MFR 1773. Provenance: Offering in courtyard VII of tomb 103, Monte Albán, Oaxaca. Reference: Caso 1939: 181 -183, figs. 18 & 19; Caso and Bernal 1952: 185-186, fig. 315. Comments: Caso and Bernal say: "In [the offering] there are five human figures with masks of bird beaks. 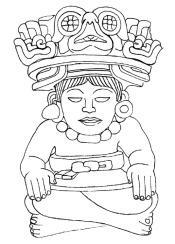 Two of them also have quetzal headdresses, while the other three are wearing serpent headdresses. 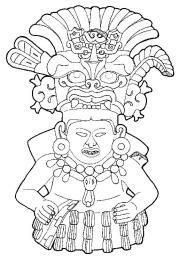 Perhaps, together, they represent the Quetzalcoatl" (Caso and Bernal 1952: 185-186). This figures has an owl's mask in headdress and holds an incense bag in the left hand. All the figures' headdresses are removable. See MNA 6-4851. Comments: Caso and Bernal say: "In [the offering] there are five human figures with masks of bird peaks. 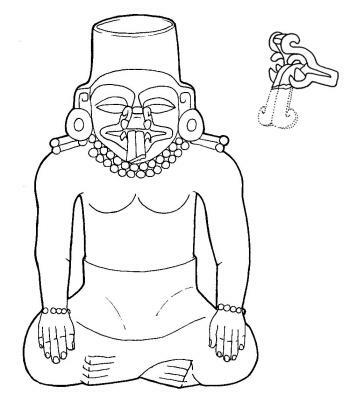 Two of them also have quetzal headdresses, while the other three are wearing serpent headdresses. 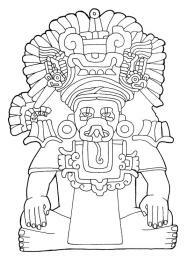 Perhaps, together, they represent the Quetzalcoatl" (Caso and Bernal 1952: 185-186). 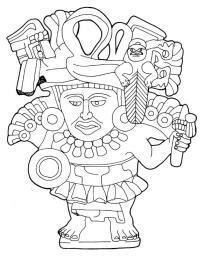 This figure wears a serpent headress and holds a what could be a mirror at his midrift. All the figures' headdresses are removable. See MNA 6-4850. 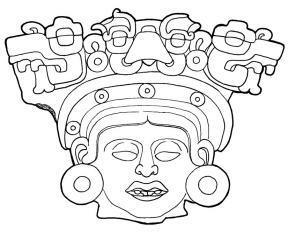 Glyphs: The mask of glyph V "alligator" in the headdress.